If you're planning to replace your garage door opener, it's possible to feel overwhelmed by all the options available. Good thing is, we are here to help. Our team can provide professional insights as to what’s on the market and help you choose the right unit for your needs, requirements and of course, budget. Which Drive Type To Choose? The most important decision you have to make with regards to your new opener will be the type of drive to go for. There are chain drives, belt drives, and screw drives to choose from. Chain drive openers are the oldest type available. They remain popular among homeowners mostly because they are inexpensive. However, they can be noisy and are usually considered to be inappropriate for those who have a bedroom adjacent to the garage. Unlike chain drive openers, belt drives operate on a rubber belt, making them work more smoothly and quietly. 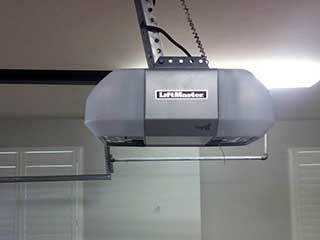 Screw drive door openers are a cut between the first two types of garage door openers. They are less noisy than chain drives and cheaper than belt drives. Another factor to consider when choosing an opener is the safety provisions installed with every kit. Newer models are updated with safety features to provide homeowners with safer operation and security. For example, current openers come with an automatic reversal function to prevent garage door related injuries and damage, this makes the door panels automatically reverse if the sensors detect something in the way of the door while closing. Rolling code technology is another feature that many find to be of great use as it prevents intruders from eavesdropping and gaining access to the code. Depending on the kind of household that you run and the size of the budget you are working with, we can help you choose an opener that will suit your lifestyle and needs exactly. Our company is also experienced when it comes to fixing all kinds of opener related problems - just get in touch with us at Garage Door Minneola to arrange an appointment.